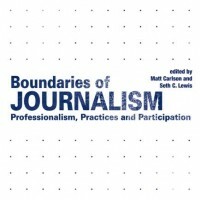 Matt Carlson and Seth Lewis have just published Boundaries of Journalism: Professionalism, Practices and Participation, an edited collection on the study of boundary work and journalism, and part of the Shaping Inquiry in Culture, Communication and Media Studies series edited by Barbie Zelizer. Below is an excerpt from Matt’s introductory chapter, and further information can be found here as well as via Routledge, Amazon, and Google Books. 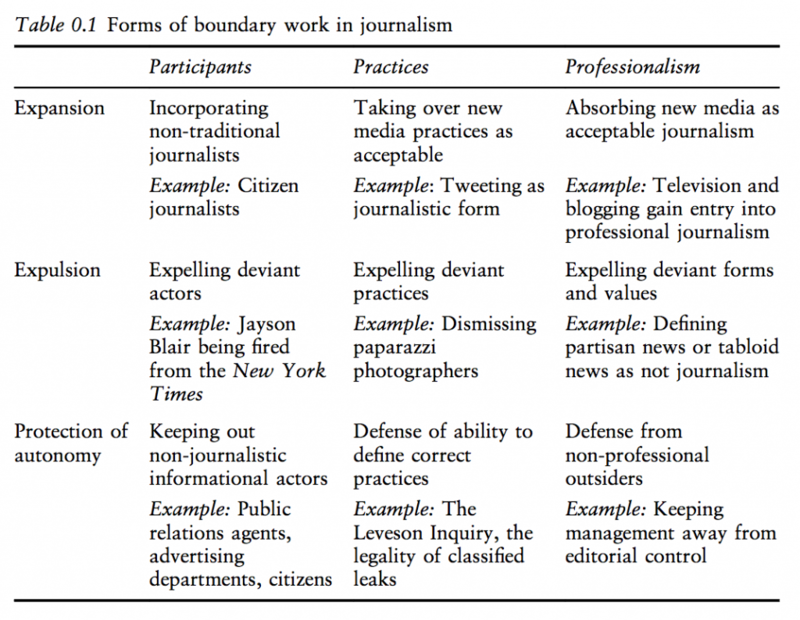 A review of how the concept of boundaries has been used in journalism studies reveals a growing body of research seeking to understand the demarcation of journalism norms, practices, and participants. For the most part, studies have explored the nuances of boundary work taking place within individual cases. What is clear from these efforts is the stubborn lack of cohesion plaguing the practice of journalism. It is also clear that it is time to look across studies taking up the mantle of boundary work to identify common themes and propose future research. This section takes up this task, although with the caveat that categorizing patterns within journalism studies requires its own cartographic intervention. From the existing work on journalism’s boundaries reviewed in this section, it is clear that there cannot be a single, one-dimensional understanding of boundary work and journalism. Instead, what is needed is a broader framework capable of encompassing different types of boundaries while relating these types within a cohesive structure. This section proposes such a matrix to situate individual studies of boundary work and journalism alongside one another in a systematic way. The main components of this matrix, presented as rows in Table 0.1, are Gieryn’s three generic types of boundary work — expansion, expulsion, and protection of autonomy — and, as columns, three areas of journalism around which boundary work occurs — participants, practices, and professionalism. Beginning with the columns, at its most basic, boundary work surrounding “Participants” involves placing lines separating journalists from non-journalists. But it also points to complex efforts to stratify actors both inside and outside of news. If the question at the heart of participants-based boundary work is “who is appropriate?” then the basic question for the second column, “Practices,” concerns “what is appropriate?” It is here that the boundaries of acceptable newsgathering or distribution methods are set. Finally, the area of “Professionalism” includes efforts by journalists to establish themselves as a distinct community with specialized knowledge. Certainly this involves both participants and practices, but it is situated as its own column because of the close connection between professionalism and epistemic authority. The rows in Table 0.1 correspond to Gieryn’s generic boundary-work typology. Although expansion, expulsion, and protection of anonymity are not specific to journalism, these types can be adapted to fit journalistic boundary work. “Expansion” denotes efforts by journalists to extend the borders of what may be considered journalism into new domains. Here Gieryn dovetails with Abbott’s concept of jurisdictional claims in which different groups (or occupations) compete to rightfully control an area of knowledge production. With journalism, expansion can be seen in the spread of journalism from print to electronic formats beginning with radio and later encompassing television, and online formats like blogs. “Expulsion,” by contrast, relates to struggles to erect or strengthen boundaries within journalistic practice to reposition something or someone as being outside of acceptable journalism. Expulsion acts as a “means of social control” in which “borders get placed and policed.” The classic example is the expulsion of those actors branded to be deviant. Their exile provides the journalistic community with an opportunity to publicly set the “boundaries of the permissible.” For example, when reporter Jayson Blair was fired from the New York Times after being caught fabricating and plagiarizing stories, the newspaper — and the larger journalistic community — reacted by reaffirming core norms and practices. Another example of expulsion in journalistic boundary work would be a contest over whether some new form laying claim to “journalism” — or encroaching on journalism’s jurisdiction — is actually journalism. Expulsion-based boundary occupies much of the research on the boundaries of journalism. Winch put Gieryn’s framework to use regarding professionalism with his study of how journalists draw sharp distinctions between tabloid-style journalism and hard news. Other scholars have studied the expulsion of specific practices, including paparazzi style photography following the 1997 death of Princess Diana, pack journalism by political reporters, constructed quotations, earnestness, and questionable newsgathering practices. Efforts to establish boundaries also occur through memory work. Both expansion and expulsion boundary work involve the extension or contraction of what qualifies as journalism. By contrast, the category of “Protection of autonomy” involves fending off incursions by non-journalists seeking to control or shape journalism. It is not that these outsiders wish to be labeled as journalists. Instead, they seek to influence journalism in what journalists perceive as a threat to autonomy. 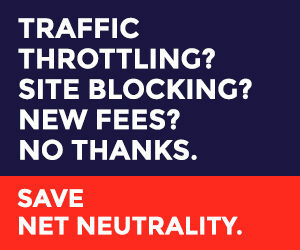 For example, the protection of autonomy can be seen in efforts to oppose advertisers from manipulating editorial content. Or, in the UK, journalists have opposed efforts by the government to enact regulatory statutes over news in the wake of the News of the World Scandal and the Leveson inquiry. The protection of autonomy is deeply ingrained within journalism, as Revers’s study of U.S. statehouse reporters uncovered. The journalists he studied displayed internalized boundary performances of journalists through their eagerness to act professionally and avoid non-journalistic behavior. Future work will hopefully go beyond rhetoric to connect boundaries with performativity. A few words of warning are needed at this point. First, like any model, the bounded space of a matrix appears more orderly than actual boundary work practices — or the studies of such practices. Journalistic boundary work certainly spills over across the cells of this matrix, which are by no means mutually exclusive — nor should they be. In placing studies within this matrix, what is important is where the emphasis of the boundary work taking place falls among participants, practices, and professional norms. What do the actors involve accent in their arguments for establishing — or erasing — divisions? At the same time, the different combinations that occur deserve attention for what they indicate about the nature of journalistic boundary work. Second, the matrix appears to freeze time, locking journalism into place. However, the boundaries that develop should not be construed as temporally static. Instead, different participants, norms, or practices move through across the cells over time. For example, where blogging was once largely expulsed from journalism as the work of amateurs, in recent years the boundaries of journalism has expanded to encompass blogging as an acceptable form for disseminating news. Such movement is not a failure of the matrix but rather an indicator of the malleability of journalism’s borders over time. Longitudinal investigations of expulsion and expansion should be encouraged. Finally, this matrix is not some natural entity with immutable laws but a constructed representation aiming to shed light on boundary work. That is, to explain boundaries, this matrix creates boundaries. Like all representations, it is open to challenge and alteration. Therefore this matrix should not, by itself, crystallize a conception of what constitutes journalism. To do so would be counterproductive. Rather, this matrix provides a model sensitive to the many directions from which journalism comes to be constructed or contested — the task to which this book is dedicated. Gieryn, Cultural Boundaries of Science, 15-17. Abbott, The System of Professions, 88. Jane Singer, “The political j-blogger ‘normalizing’ a new media form to fit old norms and practices,” Journalism 6, no. 2 (2005): 173-198. Gieryn, Cultural Boundaries of Science, 16. Matt Carlson, “Gone, but not forgotten: Memories of journalistic deviance as metajournalistic discourse,” Journalism Studies, forthcoming (2014). David Eason, “On journalistic authority: The Janet Cooke scandal,” Critical Studies in Mass Communication 3, no. 4 (1986): 429-447. Elizabeth Hindman, “Jayson Blair, The New York Times, and Paradigm Repair,” Journal of Communication 55, no. 2 (2005): 225-241. Samuel Winch, Mapping the cultural space of journalism: How journalists distinguish news from entertainment (Westport, CT: Praeger, 1997). Dan Berkowitz, “Doing double duty Paradigm repair and the Princess Diana what-a-story,” Journalism 1, no. 2 (2000): 125-143; Ronald Bishop, “From behind the walls: Boundary work by news organizations in their coverage of Princess Diana’s death,” Journal of Communication Inquiry 23, no. 1 (1999): 90-112. Russell Frank, “These crowded circumstances: When pack journalists bash pack journalism,” Journalism 4, no. 4 (2003): 441-458. Elizabeth Fakazis, “Janet Malcolm constructing boundaries of journalism,” Journalism 7, no. 1 (2006): 5-24. Matt Carlson and Jason Peifer, “The Impudence of being earnest: Jon Stewart and the boundaries of discursive responsibility,” Journal of Communication 63, no. 2 (2013): 333-350. Matt Carlson and Dan Berkowitz, “’The emperor lost his clothes’: Rupert Murdoch, news of the world and journalistic boundary work in the UK and USA,” Journalism, forthcoming (2013). Dan Berkowitz and Robert Gutsche, “Drawing lines in the journalistic sand; Jon Stewart, Edward R. Murrow, and memory of news gone by,” Journalism & Mass Communication Quarterly 89, no. 4 (2012): 643-656. Henrik Örnebring, “Anything you can do, I can do better? Professional journalists on citizen journalism in six European countries,” International Communication Gazette 75, no. 1 (2013): 35-53. Sue Robinson, “Traditionalists vs. convergers: Textual privilege, boundary work, and the journalist-audience relationship in the commenting policies of online news sites,” Convergence 16, no.1 (2010): 125-143. Charlie Beckett and Robin Mansell, “Crossing boundaries: New media and networked journalism,” Communication, Culture & Critique 1, no. 1(2008): 93. See also Marie-Claire Shanahan, “Science blogs as boundary layers: Creating and understanding new writer and reader interactions through science blogging,” Journalism 12, no. 7 (2011): 903-919. Mark Coddington, “Defending a paradigm by patrolling a boundary: Two global newspapers’ approach to WikiLeaks,” Journalism & Mass Communication Quarterly 89, no. 3 (2012): 389. See also: Scott Eldridge, “Boundary maintenance and interloper media reaction: Differentiating between journalism’s discursive enforcement processes,” Journalism Studies 15, no. 1 (2014): 1-16. Matthias Revers, “Journalistic professionalism as performance and boundary work: Source relations at the state house,” Journalism, forthcoming (2013). Jo Bogaerts, “On the performativity of journalistic identity” Journalism Practice 5, no. 4 (2011): 399-413. Marcel Broersma, “Journalism as performative discourse: The Importance of form and style in journalism,” in Journalism and meaning-making: Reading the newspaper, ed. Verica Rupar (Cresskill, NJ: Hampton Press, 2010), 15-35.